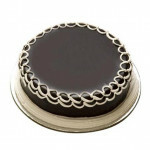 Here is a yummy delicious chocolate cake beautifully outlined with whipped white vanilla cream on the top. Surprise your loved one in a special way with a lip smacking delish chocolate cake that they are going to love for sure. The cake has been given an awesome touch with the cream. Get this present for your love today to get a yummy and delicious smile from their side.